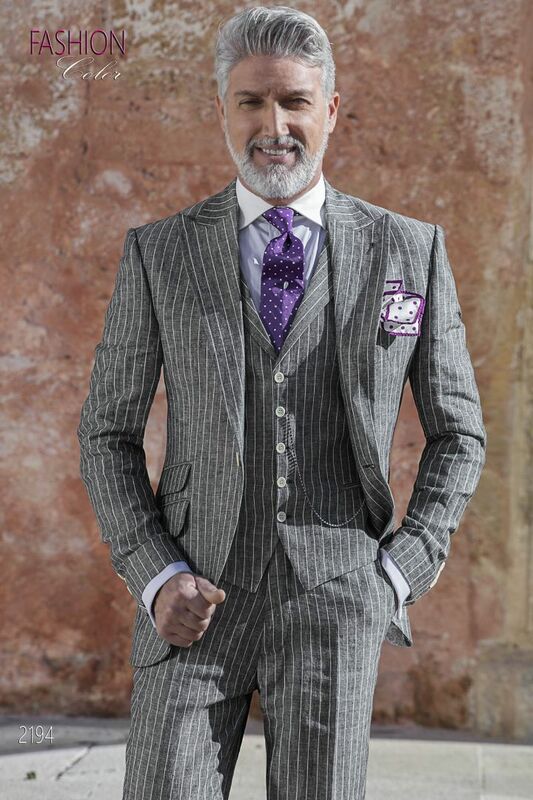 Pure grey pinstriped linen vest with notch lapel. 5 mother-of-pearl buttons and 2 double welt pockets. Contrasting back ... Pure grey pinstriped linen vest with notch lapel. 5 mother-of-pearl buttons and 2 double welt pockets. Contrasting back lining with blue cashmere floral design on a white background, with elastic band to adjust width. Krawatte 8,5 cm, violett mit weiße Tupfen-Design, aus reiner Seide. Ganz handwerklicher Bearbeitung. Einstecktuch, weiß mit violett Tupfen-Design, aus reiner Seide. Anstecknadel mit Perle und Schutzspitze.